NIA CHARLESTOWN NEVIS (September 26, 2014) — Plans are afoot for an operating waste to energy plant on Nevis by the latter part of 2015. 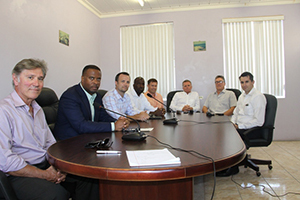 The disclosure was made by Chris Burgess Chief Operations Officer of Omni Alpha, an American based renewable energy developer and integrator, at a press briefing at the Nevis Island Administration’s (NIA) conference room on September 24, 2014. Omni Alpha partnered with the NIA in August 2014 when Power Purchase Agreements and a Waste Supply Agreement were signed for the project which promised employment and effectively manage the island’s solid waste. The Chief Operations Officer added that his organisation would also donate two municipal waste trucks as part of the project which would support the delivery of the waste that would be needed to sort and ingest into the gas mutation system. According to Burgess, work on the ground in terms of site preparation would commence ahead of construction. “Work on the ground in terms of site work we hope to start by the end of the year, so December in terms of excavation, getting the site pad, fencing and then equipment ordering the lead times on these things are eight to 10 weeks so we have got to get our engineering designs in early, get everything ordered, get the sight pad ready for the delivery and construction,” he said. Regarding employment, the Chief Operations Officer indicated that Omni Alpha would be seeking most of its experts on island. “Part of the partnerships is employment opportunities. We are going to look to Nevis to hire experts in engineering, in construction, in equipment rental. We don’t plan to import a lot of talent. We hope to find our talent here on the island,” he said. In response to the number of persons that would be employed with the project, Burgess spoke to employment in the construction stage and beyond, including a solar energy generation component. “It really comes down to the construction effort, what type of machinery we are going to bring here, what type of operators but I think a safe guess on the construction side will be in the 50-60 person range and then based on the operation, we are going to assess that at a later date and determine how many shifts we are going to work and how many people we are going to employ at the waste to energy. “I can say with confidence, the majority of the jobs will be at the waste to energy plant, the solar is somewhat self-sufficient and monitored remotely but we will hire local electricians to do operation and maintenance to fix things as is needed,” he said. However, Burges used the opportunity to give some insight into the waste to energy system. “The waste to energy system is very open and can take lots of different wastes but there are items it cannot take. “Those items include all the metals on the island a lot of the e-goods which are a lot of the old electronics and appliances and we have Mr. Steve Hammond who is our recycle manager at Omni Alpha and he will be actually crushing cutting, barrelling and shipping any of the metal waste of the island as part of this project. That may happen as early as November/December of this year,” he said. The Chief Operations Officer assured that the technology used for the waste to energy plant was environmentally safe and in keeping with international standards. “It is often a concern with waste to energy is the emissions. We made a distinction earlier between just burning and gasification. Gasification is all enclosed so there is no ignition, there is no smoke. It’s all done within the modules and there is a state-of-the-art US EPA standard emission control system after that. So what I am told by my scientist it’s very comparable to a late model vehicle in terms of emissions,” he said. Burgess stated too, that they had engaged local support from Janice Hodge for the Environmental Impact Assessment (EPA). 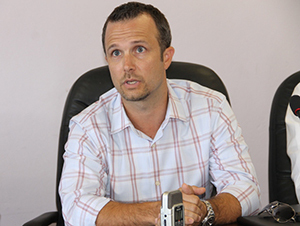 However, responding to whether Nevis was generating enough waste to sustain the project, Burgess said several studies had been done in that regard. “We have done quite extensive studies for the last several months on the waste data from 2001, 2012, 2013, plus we have done site surveys on the existing landfill, the tyre storage and of green and wood waste that’s there and there is sufficient amount to support a one megawatt generator which is roughly 25 tons per day,” he said. The Chief Operations Officer indicated that Omni Alpha had done much work in the Mid-Atlantic with small community systems, regional systems and large transmission systems in the electrical grid in the United States. However, Derya Yavalar spoke to the company’s experience in infrastructural work. “We have done major infrastructural work all over the world and it’s going all the way back to the Soviet Republics as well as Africa and also places like in Haiti and Panama. “We have done projects in internationally developing countries and we the highest employment we have created was about 150 people on an infrastructure project on a country about the size of 8 million people. So we have experience building projects on the infrastructure,” he said.